From an early age, Dr. Sarah knew she had an interest in dentistry as she came from a household of physicians who inspired her to follow in their footsteps. Dr. Sarah graduated from Boston University Henry M. Goldman School of Dentistry in 2006, after which she completed a one-year residency in Advanced Education in General Dentistry at Case Western Reserve University School of Dental Medicine. Originally from East Africa, Dr. Sarah completed her undergraduate degree in her home country. In addition, Dr. Sarah completed a postdoctoral residency program in Pediatric Dentistry from Nicklaus Children’s Hospital, formerly known as Miami Children’s Hospital. In 2017, Dr. Sarah purchased the practice from Dr. Herer and is pleased to continue the caring atmosphere of Children’s Dentistry Group, LLC. 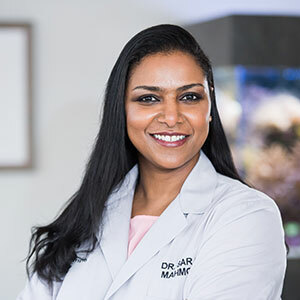 Dr. Sarah is currently a Diplomate of the American Board of Pediatric Dentistry and holds memberships within the American Academy of Pediatric Dentistry, the American Board of Pediatric Dentistry, the American Dental Association, and the Illinois Society of Pediatric Dentistry. It’s Dr. Sarah’s passion to help improve the smile of children, setting them on the best path towards proper oral health possible. In order to provide the best possible care to her patients, she continues to take professional development courses each year. Dr. Sarah finds the most fulfilling part of being a dentist to be aiding in the relaxation of children while providing a positive experience and educating them about proper oral hygiene. When she isn’t helping to craft children’s smiles in the practice, Dr. Sarah enjoys traveling to different places and learning about different cultures. She loves spending time with her husband, Hatim, and two sons, Jamal and Sami. Get to know more about Dr. Sarah when you book your next visit with our practice.